The city of Norfolk, Virginia, may become one of the first cities in the US to be claimed by rising seas brought on by climate change. Over the past decade, residents of the east-coast naval city have seen a steady uptick in hurricanes and flooding from high tides, wind surges that drive seawater ashore, and overflowing storm drains. Yet, based on the recently released National Climate Assessment report by the US government, coastal cities in the south east—including Norfolk—are not ready to cope with rising sea levels. While the city “has begun to invest in mitigation and adaptation actions”, the report says, “recent estimates indicate it will cost hundreds of millions of dollars to improve storm water pipes, flood walls, tide gates, and pumping stations”. 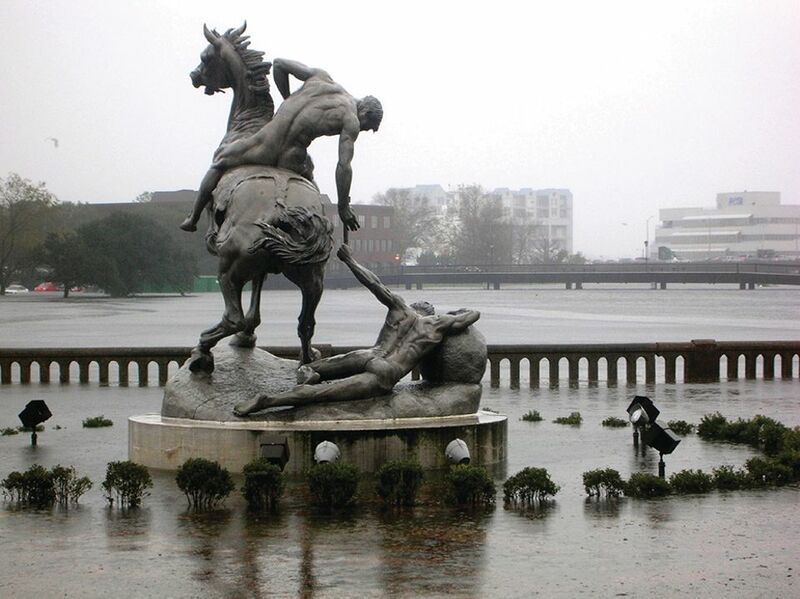 For arts venues in the region, resiliency plans are no longer just a question of how to keep the floodwaters back, but also how to accommodate the regular arrival of water and create pathways for it to run quickly back into river or sea. The Chrysler Museum of Art, located on the bank of the Hague—an inlet off the Elizabeth River—completed renovations in 2014 that emptied the basement, moving the on-site collection well above sea level, and raised the ground floor galleries by 10ft. (The museum also stores objects at an offsite location.) Now its long-range plans include elevating the streets around the building and potentially acquiring more land to create a space that would help absorb run-off water. At the Hermitage Museum & Gardens, located further north on the edge of the Lafayette River, plans are also under way to mitigate the effects of climate change. A $1.7m city-run wetlands project will restore marshland in the surrounding area that has been eroded, and the Hermitage’s Visual Arts School will undergo renovation over the next few years, including plans to accommodate “the water moving across the property and back into the river”, says Jen Duncan, the museum’s director. The museum building itself is located on the highest part of the property and Duncan says she has yet to see water crest the bulkhead, though it has come close. None of the buildings on the property can be raised or significantly altered due to their being historic and so subject to conservation guidelines. While institutions work to flood-proof their properties, they are also incurring increasing insurance costs, as well as incidentals from closure during hurricanes and storms. “There’s a steady increase in insurance year after year, which is unpleasant but it’s not such a dramatic increase that it’s making the situation intolerable,” Duncan says. Institutions say that, by and large, they are getting the support they need from local and federal governments, but scientists’ predictions suggest a future for the city that may require a more united and comprehensive strategy to protect the arts community (and the city as a whole). Scientists at the Virginia Institute of Marine Science have gamed out three different scenarios for sea-level rise in the region, and say a moderate estimate would see the ocean water climb by 4.5ft by 2100—with king tides and storms extending the flood area inland. More extreme predictions forecast a 6ft sea-level rise or more. This year, the National Oceanic and Atmospheric Administration (NOAA) has recorded 14 days of high-tide flooding in Norfolk. William Sweet, a scientist at NOAA, says that he expects that figure to increase to between 50 and 75 days of high-tide flooding per year by 2050, and likely jump to between 250 and 325 days per year by 2100.